9. Joel Riley, Giovanni Quarato, et al. 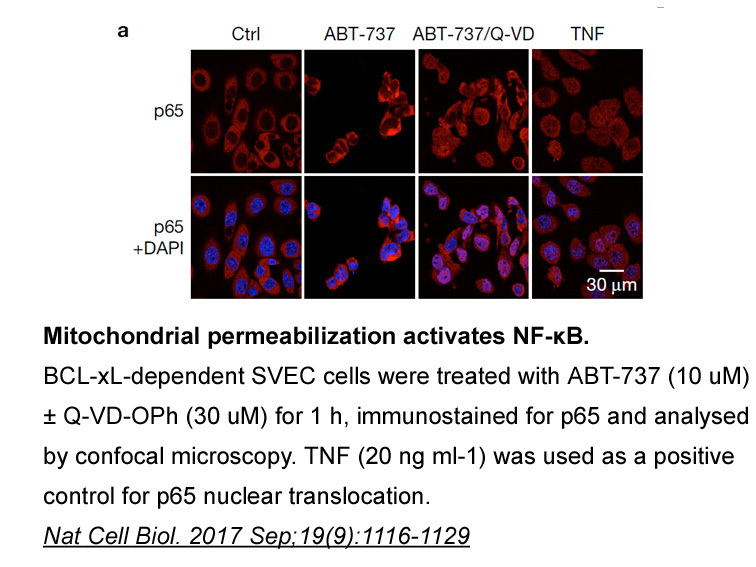 "Activated BAX/BAK enable mitochondrial inner membrane permeabilisation and mtDNA release during cell death."bioRxiv. 2018 February 26. 10. Frevert, Marie Louise. "24 drugs as potential SKP2 Inhibitors: a novel approach to finding new antidepressants. Dissertation, LMU München: Medizinische Fakultät." d-nb.info. 2017. 12. Kris Cameron Wood,Peter Saville Winter. "Compositions and Methods for Treating Cancer with JAK2 Activity." US Patent App. 15/027,216, 2016. 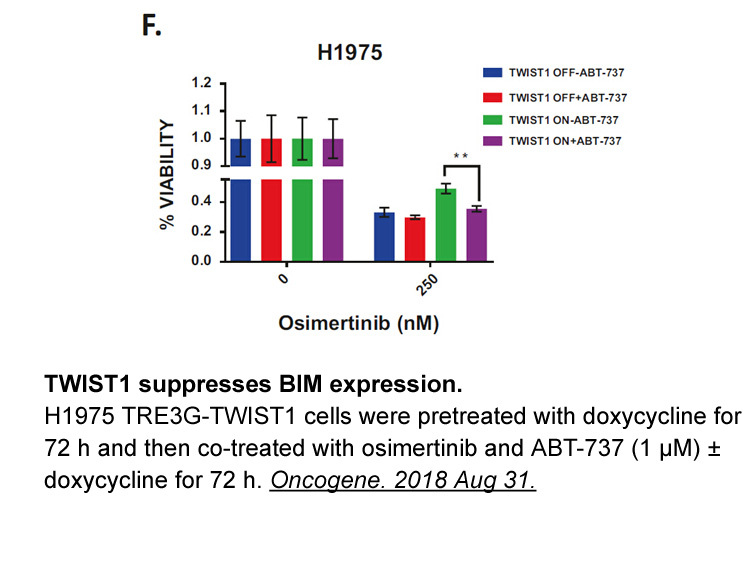 ABT-737 is a BH3 mimetic inhibitor of Bcl-xL, Bcl-2 and Bcl-w with EC50 of 78.7 nM, 30.3 nM and 197.8 nM, respectively; no inhibition observed against Mcl-1, Bcl-B or Bfl-1. Small-cell lung cancer (SCLC) cell (NCI-H889, NCI-H1963, NCI-H1417, NCI-H146, NCI-187, DMS79, NCI-1048, NCI-H82, NCI-H196, H69AR, and DMS114) lines. The ability of ABT-737 to inhibit cell proliferation with single-agent activity was evaluated against a panel of 11 kinds of SCLC cell lines. 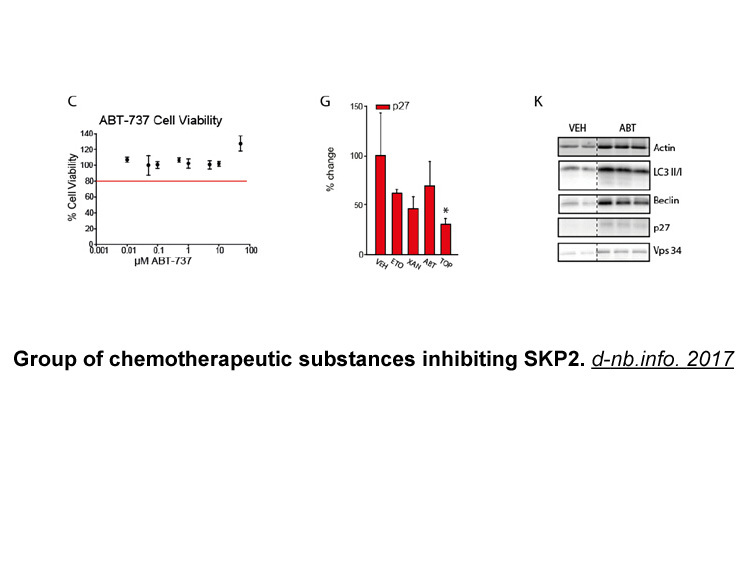 Ac-DEVD-AMC, a substrate for activated caspase 3, was used to treatment of H146 cells for 24 h. A dose-dependent increase in apoptosis coincided with a dose-dependent decrease in cell viability following ABT-737 treatment suggesting that ABT-737 inhibits cell proliferation through the induction of apoptosis. 75 mg/kg body weight; the tail injection. All B-lymphoid subsets in the ABT-737-treatment (75 mg/kg) cohort were significantly decreased, compared with the vehicle-treated animals, in both the bone marrow and the spleen. Eμ- myc animals treated with ABT-737 contained significantly (**P<0.01) more apoptotic cells in their bone marrow than vehicle-treated mice. Tahir S K, Yang X, Anderson M G, et al. Influence of Bcl-2 family members on the cellular response of small-cell lung cancer cell lines to ABT-737[J]. Cancer research, 2007, 67(3): 1176-1183. Kelly P N, Grabow S, Delbridge A R D, et al. 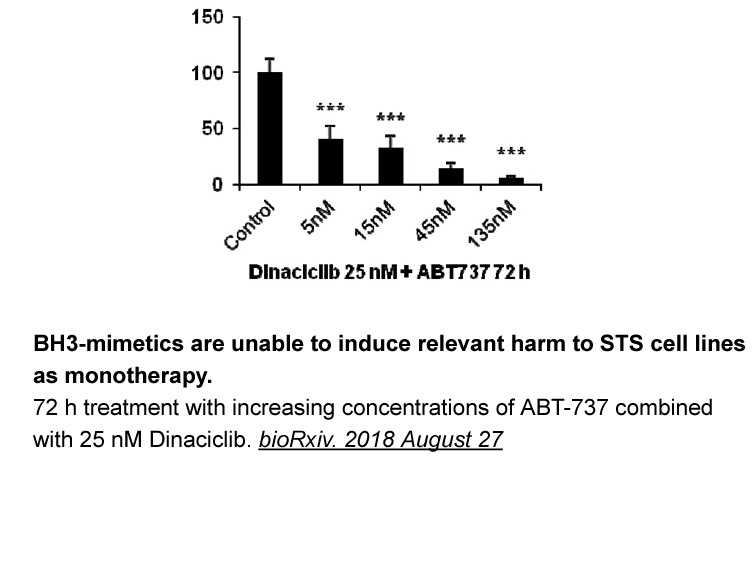 Prophylactic treatment with the BH3 mimetic ABT-737 impedes Myc-driven lymphomagenesis in mice[J]. Cell Death & Differentiation, 2012, 20(1): 57-63. 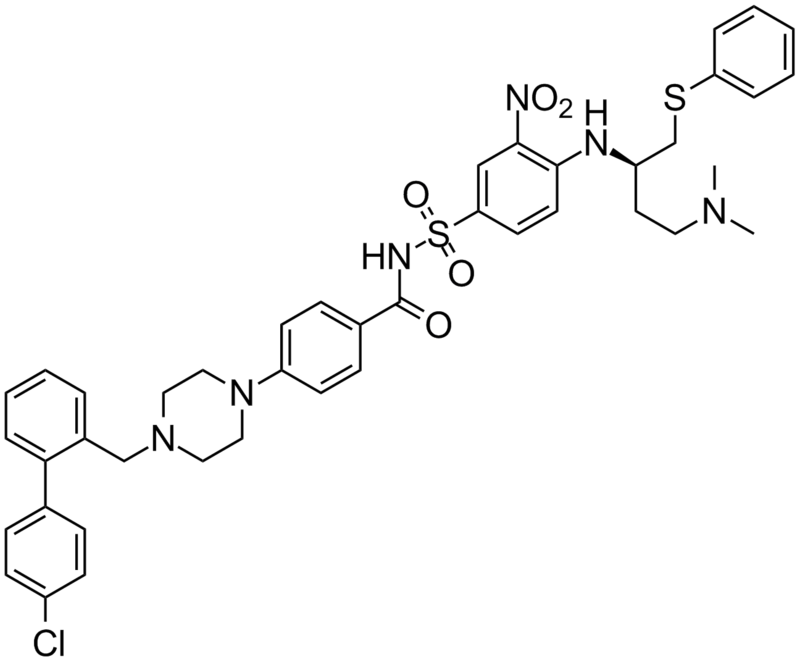 ABT-737 is a novel and potent inhibitor of B-cell lymphoma 2 (BCL-2) family proteins, which are critical for cell survival and overexpressed in many tumor cells, with high affinity towards BCL-XL, BCL-2, and BCL-w but no affinity towards less homologous proteins, such as BCL-B, MCL-1, and A1. 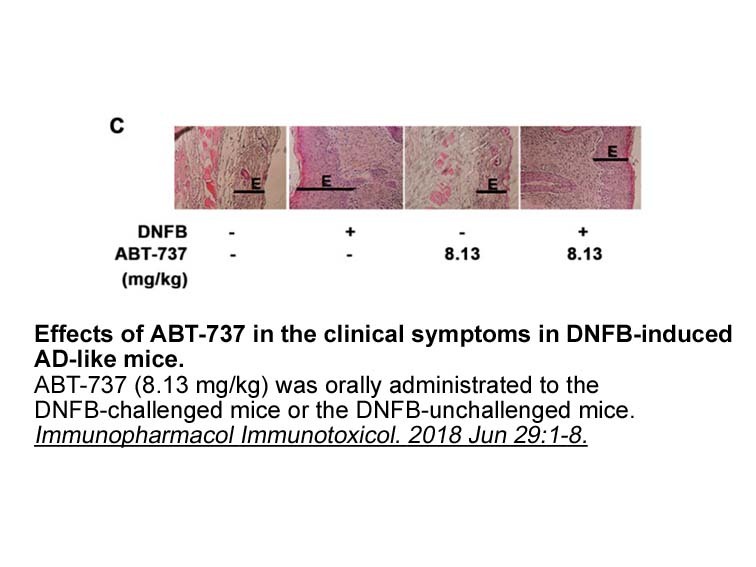 ABT-737 has shown single-agent activity against lymphoma and small-cell lung cancer as well as substantial antimyeloma activity both in vitro and in vivo. 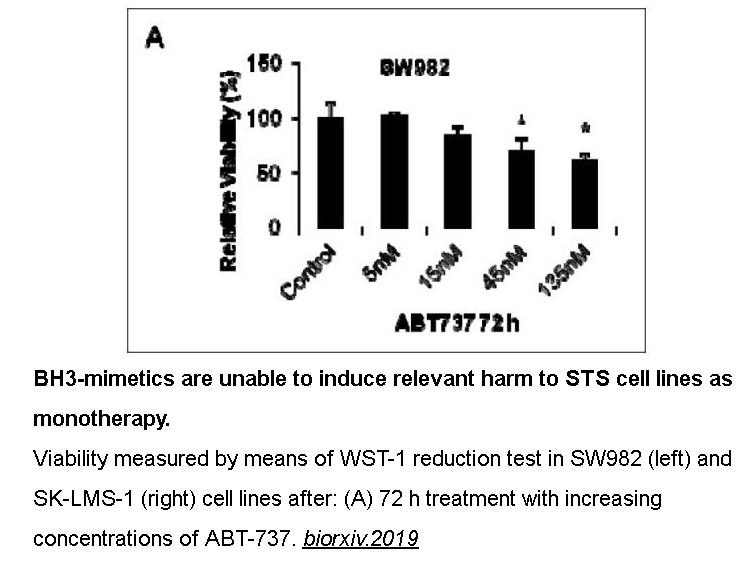 In recent studies, acute myeloid leukemia blast, origenitor, and stem cells are effectively killed by ABT-737 with normal hematopoietic cells intact. 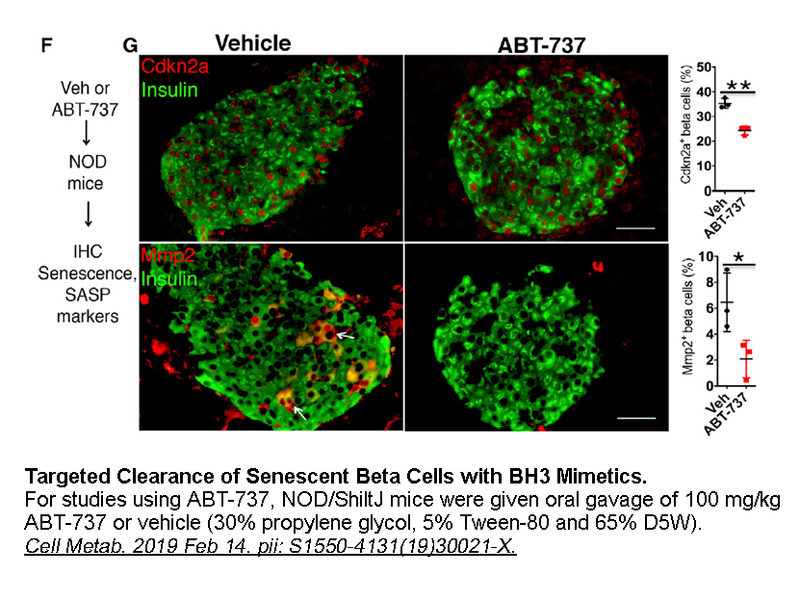 The disruption of the BCL-2/BAX complex and BAK-dependent but BIM-independent activation of the intrinsic apoptotic pathway could also be induced by ABT-737.